For the novice chef, cooking meat to the perfect temperature can be daunting. From the tender medium rare steak to the juicy, yet fully cooked chicken, meat temperature can make a huge difference in the taste of a dish. While professional chefs can tell temperatures by sight and touch, the home chef can use a little assistance. The Digital Meat Cooking Thermometer helps to make your cooking better. Money back Satisfaction Guarantee, Lifetime Warranty. This thermometer is great when used for outdoor grilling. For example, when cooking lots of steaks, this thermometer can help ensure that everyone gets their perfect done-ness. I would caution using it in extreme temperatures (like in a big green egg). The thermometer is easy to read. The on/off feature is important. But, I would use caution when washing and make sure that it doesn't get immersed in water. 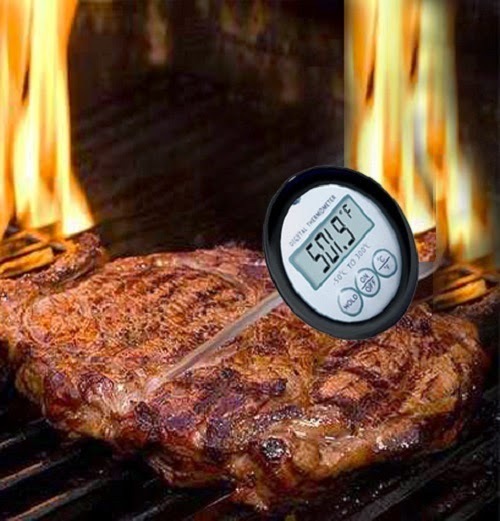 Would you like to try this digital meat cooking thermometer? Please use the Rafflecoper to enter.